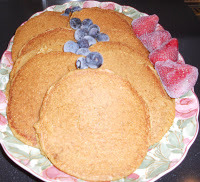 Caroline Valentine at Camai Bed and Breakfast in Anchorage, Alaska, tried a new breakfast recipe this week for Cornmeal Flapjacks served with berries. Winter is almost over and the revision of the recipes for summer guests has almost been completed. Table is set and breakfast is ready. 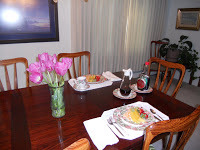 Come stay at Camai Bed and Breakfast and join us for breakfast. If doing this in the winter you could use frozen berries or bananas. Mix together the dry ingredients. Add the beaten egg, oil, molasses and buttermilk. Heat griddle to 325 degree, then oil. Drop almost ¼ cup batter onto griddle for each flapjack. Cook about 2 minutes on each side. Keep in warming drawer until ready to serve. Serve with berries and maple syrup or blueberry syrup. Makes about 12—4 inch flapjacks. To make this recipe more healthy I suggest using ¾ cup wheat flour instead of white flour. Either way you will enjoy! This entry was posted in Recipe and tagged breakfast recipe by admin. Bookmark the permalink.